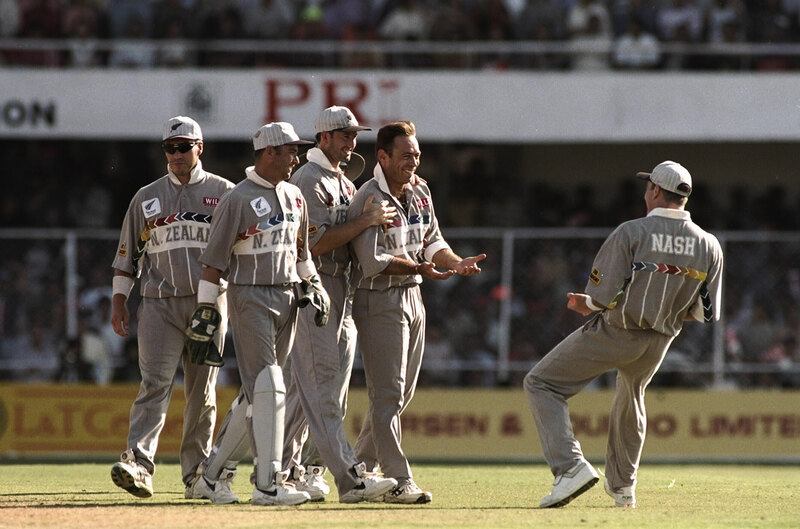 I became a New Zealand cricket fan just over a quarter of a century ago; on February 22, 1992 to be precise. It had been a gradual process, but having lived there for the best part of a decade, something happened that made me finally decide to adopt my new country over England, the country of my birth. I had moved halfway across the world to Wellington because of work and soon fell in love with the city. What could be better than coming up with big advertising campaigns during the day and then spending the late afternoon on the beach? It was an opportunity I hadn't had in Manchester. And the reason for this shameless switch of allegiance was simple. The cricket World Cup had arrived - it was being co-hosted by New Zealand - and I was caught up in the excitement and national pride. Although the New Zealand team was, on paper at least, mediocre (I'd watched them through disinterested eyes since arriving in the country in 1982) the hype was contagious. You couldn't turn on the TV or radio without hearing the tournament's official theme song, "Who Rules the World?" It was insanely catchy, and, despite containing the demonstrably untrue claim that this was a "once-in-a-lifetime chance to rule the world", succeeded in stirring up anticipation. Especially when it was combined with the innovations that were about to hit the sport I loved. Some of these were genuinely thrilling. White balls, black sightscreens and day-night cricket were about to inject excitement into a game that had gone a bit stale. And as if that wasn't enough, teams were going to be wearing coloured uniforms. In keeping with their fairly dour image at the time, New Zealand were kitted out in a sombre grey, in stark contrast to the bright yellow worn by the swashbuckling Aussies. And it was these two teams that opened the tournament, meeting in Auckland. There was such a sense of unity and national pride - something that had not been noticeable among cricket fans until then - that it was the first time I'd felt as though I belonged in the country. As the umpires walked out, looking like 1970s game-show hosts in their brown jackets and white shoes, towns and cities came to a virtual standstill. A packed Eden Park saw the New Zealand side (or Young Guns as they were now called, despite nearly half the team being over 30) led out onto the field by a man who was already my hero. 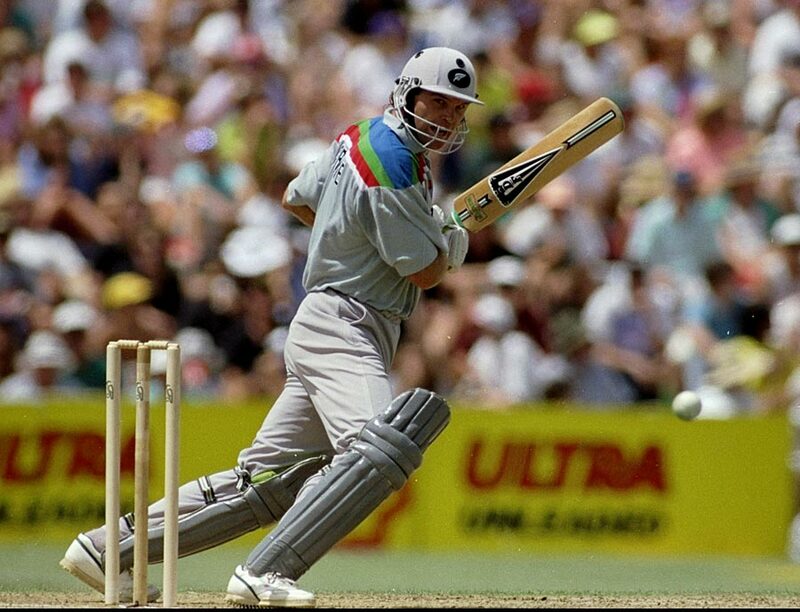 In New Zealand, Martin Crowe was everyone's hero. Restless and inventive, he was a cauldron of ideas, both on the field (audaciously opening the bowling with offspinner Dipak Patel) and off (his silver neck chain with cricket-bat pendant was often advertised in the same magazines as his range of casual shirts, both of which he modelled himself). The game started disastrously, with John Wright going first ball, but that was forgotten by the time Crowe, with typically immaculate timing, brought up his century from the second to last ball of the innings. Then Gavin Larsen, a bowler who intimidated no one, took three key Australian wickets, and when New Zealand pulled off a shock win, the pitch was invaded by "30,000 Kiwis" - according to the TVNZ commentator, anyway. The next morning, the result still hadn't sunk in. Beating the Aussies? Did that really happen? The seemingly insignificant Zimbabwe v Sri Lanka clash later that day took on such importance - the Sri Lankans were our next opponents - that the game was shown on the giant screen (a gargantuan 25", if memory serves) in the boardroom at work. It was packed for most of the day. People were sensing that we were on the verge of something special, and when we beat Sri Lanka in Hamilton with almost two overs to spare, the feeling grew. Willie Watson, who had once described being taken to the cleaners by Kris Srikkanth and Sunil Gavaskar in the previous World Cup as "like bowling in the highlights", was largely responsible. Once we took care of South Africa, the press began talking of a clean sweep, eight from eight in the qualifying round. People at work who'd had no interest in cricket had now fallen in love with it. There were no other topics of conversation. Everyone had an opinion on Chris Harris' slightly awkward bowling action or Mark Greatbatch's role as a pinch-hitter. By now, shops were overflowing with T-shirts, mugs, cricket ball-shaped soaps, jigsaw puzzles and even Young Guns phone cards. If there was a souvenir, I bought it. The official Cricket World Cup T-shirt was so commonplace, it became a sort of de facto national uniform. And the song sold in huge amounts. Who rules the world? There was a growing feeling that it could be New Zealand, although it was hard to tell how my colleagues were reacting to all this, as many of them called in sick whenever the team was playing. The day after the South Africa victory was the first time that the tournament had a direct effect on my life. My Sunday League captain, who went by the name of Tubby, won the toss and announced that we'd be "having a bowl". He then threw me the ball. As the team's only spinner, I was to be taking the Dipak Patel role: opening the bowling. Depressingly, I'd never actually taken a wicket, although I reassured myself that this was no longer the objective in the limited-overs game. I muttered the words "line and length" to myself, which is what some of the Young Guns were known to do. In my first over, the opener charged up the pitch, missed the ball and handed me my first - and only, as it turned out - wicket. It was a feeling of euphoria I had never known. I was being swept along in wave of cricket, and have never loved the game as much as I did in those four weeks. On the night of the next game, against Zimbabwe, I'd guess that the highest rating TV programme was the weather forecast. There's a saying in New Zealand that if you want rain in Napier, schedule a cricket match. And if the game was rained off, we'd be sharing the points, ruining our 100% record. It was nerve-wracking watching the covers going off and on as run-rate calculations came into effect. But the worry was for nothing. New Zealand comfortably won their fourth in a row and the country went berserk. Nothing outside cricket mattered. At work, a 3" metal ruler, a squished-up ball of paper wrapped in Sellotape, and a wastepaper basket were all that was needed for office cricket. Scores in excess of 1200 were not uncommon. And the World Cup was also taking on an unreal quality. West Indies (Lara included) were beaten next, followed by India (Tendulkar included). By now, the formula was well established. The dibbly-dobbly bowlers, relying on line and length, restricted the opposition to around 200. The thrill of seeing the sixth ball of an over land in exactly the same spot as the previous five got the pulse racing. Dull and predictable had become the new exciting. The next game, against England at the Basin Reserve, looked like being one of the toughest tests yet. And I would be there to witness it. Confusingly, I'd bought the ticket when I was still an England fan. I sat in a packed Vance Stand, clutching my souvenir programme. There was real excitement and the huge ovation that the team received as they came out brought a tear to the eye. And they didn't let their country down. The bowlers, led by Patel, limited the English to 200, and Andrew Jones and Crowe got us home with time to spare. The New Zealand flags, and banners with slogans like "Great catch Greatbatch", were waving long after the players had left the field and the Barmy Army had left the ground. I'm not embarrassed to say, that even though I was in my mid-30s, I found it hard to sleep on the night of the final pool match, against Pakistan, with the tantalising chance of a clean sweep - beating all seven teams. The general feeling was that Pakistan would be taking it easy, as they had already qualified. But they didn't, and for the first time since the tournament started, the Kiwis were beaten. This was a major shock. I had begun to see them as invincible. How could this happen? The experts on TV didn't seem that bothered. According to them it was a game with nothing at stake and little more than a warm-up. But I was definitely nervous, especially since it meant that we would be playing the same opponents in the semi-final a few days later. On the morning of the match, one of the biggest in the country's history, there were reports that roads were virtually empty, as were city-centre shops. Omens were good. This was the fourth consecutive semi-final for Pakistan, and they had lost the three previous. New Zealand batted first and posted an impressive 262, with Crowe, as usual, leading the way with a quick-fire 91. With Pakistan at 140 for 4, and running out of overs, most of our thoughts were turning towards the final in Melbourne. And that was when it all went horribly wrong. Inzamam-ul-Haq joined Javed Miandad and hit the dibbly-dobblies all over the place. The target was shrinking in front of my eyes. I could only stare, open-mouthed, at the TV, feeling a sense of helplessness, which turned to despair as New Zealand's World Cup campaign fell apart. Defeat had been snatched from the jaws of victory. And there was a final twist of the knife yet to come, when England won their semi-final in Sydney. England, the team I had so cynically cast aside in a blatant grab for glory. Losing was painful, incredibly so, and it confirmed something that I had long known. However old you are, however grown up you think you may be, it really is possible to have your heart broken by a game of cricket. There were consolation prizes. Crowe finished as the tournament's leading run-scorer and was eventually named Player of the Tournament. But it was hard getting back to normal life after that. Everything seemed a bit of an anticlimax. Over time, I began to appreciate what that team had done for New Zealand cricket, and over the following years they were consistently one of the better sides. 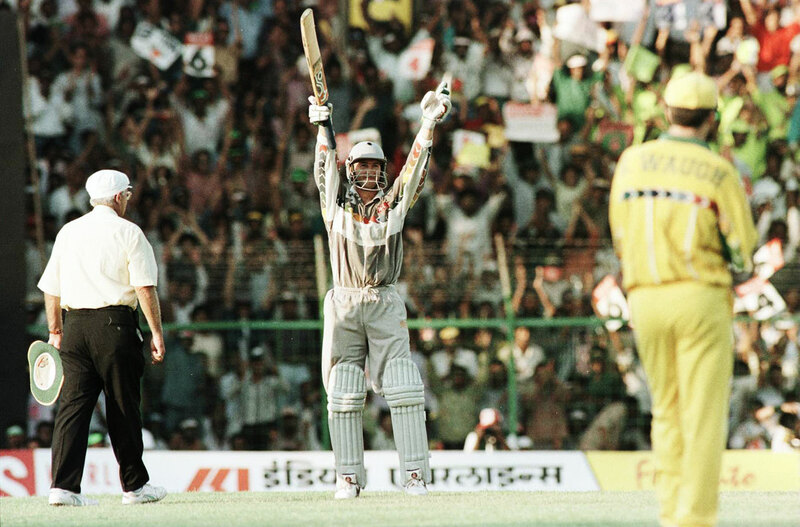 The next World Cup, in 1996, saw them fall just short of the semi-finals, despite an incredible 130 from Chris Harris. Three years later, when the tournament took place in England, New Zealand once again made the semi-final, and once again we were playing Pakistan. I stayed up all night, watching and hoping. We posted a reasonable 241, and like at Eden Park, I felt chances were good. The early hours of the morning were spent staying awake, thanks to endless cups of coffee, as I watched the Pakistan openers put on a quick 194, before their team cruised to an easy nine-wicket win. I wondered how many more semi-final losses I could take. But the next year I was back on my all-night cricket-watching vigil, during the Champions Trophy in Kenya. The Young Guns (now known as the Black Caps) almost unbelievably managed to beat Pakistan in the semi-final, thanks largely to a superb 87 from England-born Roger Twose. Our adopted team had made it through to the final. We were up against India, and the game got off to a predictable start. Sourav Ganguly and Tendulkar put on 141 for the first wicket in quick time, and by the time Tendulkar was finally out, most Kiwis had already gone to bed. But I lived in hope and New Zealand slowly clawed their way back, thanks in part to a timely contribution from Harris, who put them on course for their first ever victory in a major tournament. It was neck and neck and went down to the final over. I wouldn't have believed any human being could feel such tension watching a televised game of cricket from Nairobi. But as Chris Cairns hit the winning runs with two balls to spare, I leapt from my chair at five in the morning, punching the air, and thinking of a song I hadn't heard in years. "Who rules the world?" At last, the answer was New Zealand. Which was something I'd been craving since February 22, 1992. Where have all the dibbly-dobblies gone?